Michael P. Danziger and John Simon created The Steppingstone Foundation to help urban schoolchildren prepare for and pursue high-quality educations. 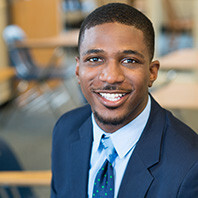 Steppingstone began by launching The Scholars Program to recruit and prepare sixth-grade students with high potential but limited opportunities for admission to prestigious college-preparatory schools in the seventh grade. Steppingstone created The Magnet Program in 1997 to prepare students for admission into competitive public exam schools. 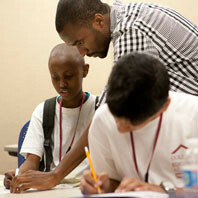 In 1999, The Scholars Program in Philadelphia launched its inaugural class. The Scholars Program and The Magnet Program in Boston merged to form The Steppingstone Academy, which also expanded to serve fifth-graders seeking placement in sixth grade. Excellent teachers, a challenging curriculum, and high standards are the signature features of Steppingstone’s work. 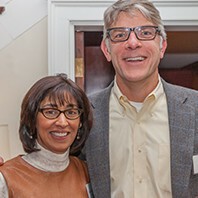 As part of a new strategic plan, Steppingstone sought to expand its impact beyond Boston. In 2006, Steppingstone convened a meeting of 25 programs to explore a partnership that would support college access and college readiness on a national scale. This conversation resulted in the creation of the National Partnership for Educational Access (NPEA) in 2007. NPEA is a membership organization that connects the people, practices, and innovations essential for eliminating barriers to educational access and college and career success for underserved students. Over the past 10+ years, NPEA has grown to serve more than 325 members in 35 states. 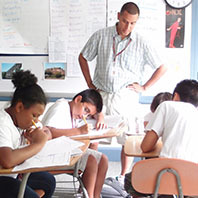 In 2007, Steppingstone also formalized a partnership with the Hartford Youth Scholars Foundation, and the first class of 31 Scholars began The Steppingstone Academy Hartford’s program of academic preparation the following summer. Hartford Scholars prepare for admission to independent day and boarding schools in ninth grade. The need and opportunity to prepare more students in the Boston Public Schools for college enrollment and college graduation had become both apparent and pressing. Low college-admission and college-completion rates continued to disadvantage graduates of Boston Public Schools. In response, Steppingstone launched the College Success Academy in 2011 to help prepare middle-school students for college-preparatory work in high school, and college acceptance and completion afterward. The College Success Academy operates after-school and summer programs for students from three public schools in Allston-Brighton – the Thomas A. Edison K-8 School, the Jackson/Mann K-8 School, and the Gardner Pilot Academy – and for students from one public school in East Boston – the Donald McKay K-8 School. The Steppingstone Foundation serves more than 1,600 Scholars, ranging from age 10 to 24. Scholars attend public, independent, Catholic, and public exam schools in Boston, and study at public and private colleges across the United States.